Another Earthquake. At School, This Time. Break between two lessons. My students were outside of the classroom, playing around, running in the corridor. Vague, I think there is a small shake. Was that earthquake…? I made sure that the shocks that I felt on the second floor of the school was not the resonance effect of the normal vibration of heavy vehicles passing by on the street side. Students’ work hanging on the window was a bit swaying when I looked at it. Slowly. It makes me believe that this was earthquake. I felt nervous. Walked out from the classroom, I asked some colleagues and students. Many of them Didn’t feel any earthquake. They were being too ‘busy’ with their world, I guess. I’m a bit paranoid, I guess. I took my bag along with my laptop, went to the regular spot to have meeting with my PDIS department every Tuesday. One of the agenda to be discuss: disaster response training at any time, in case of similar incident occurred, while the students are still in school areas. I think it must immediately scheduled. Let’s do it…! 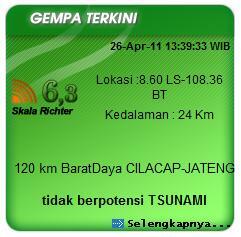 This entry was posted in daily digest and tagged Al Irsyad Satya, bandung, earthquake, postaweek2011, Primary 2. Bookmark the permalink. 5 Responses to Another Earthquake. At School, This Time. You are right. You can’t be too prepared. On March 11 many kids were stuck at school. The buses couldn’t return them until nearly or after midnight. For those with phones out you can imagine how worried the parents must have been. Yet it is difficult to cover every potential problem and luckily the pre-school had been dismissed. I have a bag of survival goods but when the house was shaking and things were falling I was not thinking to go get it. We need to learn from you, Julie. Need to learn all the good thing from Japan. My dear friend, You have spoken a great truth in that we can all learn from each other. As you work with those precious children who are the future of the world, help them to see the value of listening and learning rather than judging and criticizing. Communication is a two-way street. I also felt the earthquake that day and am ashamed to say my reaction was one of excitement, it was the first I had ever felt. I fell lucky to have only experience a small earthquake it demonstrated the power the earth can unleash at anytime and how powerless we are. You are right schools need to be prepared for all kinds of disaster as they will inevitably occur.